Preheat oven to 400° F. Cut bread into cubes then drizzle with olive oil. Add garlic and season with some salt and pepper then toss it all to combine. Spread out onto a baking sheet and pop into the oven for ~10 minutes, or until it has started to get golden edges. Lay the slices of prosciutto on the tray with (or right on top of) the bread and cook another 5-10 minutes until everything is crisp. Meanwhile, combine lemon juice w/ some olive oil (about 3 parts oil to 1 part lemon juice), then season with salt and pepper and whisk or shake to combine (I am partial to putting it all in a little jar and shaking it up). Put a small pot of water on to boil and pour in a slug of white vinegar (this helps the poached eggs hold their shape). Crack your eggs into a small dish or cup for sliding (one per dish/at a time). Turn the heat down until it barely bubbles and carefully slide your eggs in one at a time. Cook for ~4 minutes for a runny yolk. Lift out with a slotted spoon and set it on a kitchen towel to drain. Toss your dressing with your lettuces and the bread and pancetta from the oven. Divide evenly among plates, then top each with a poached egg and use a veggie peeler to shave as much Parmesan as you'd like over each salad. *IHCC: it's another POTLUCK w/ Jamie this week! Wow - I wish I had a big plate of this fabulous dish in front of me right now! YUM!!! Those eggs are perfectly done - a perfect combination of flavors. I agree, those are perfectly cooked eggs. I'll take this for lunch, please! 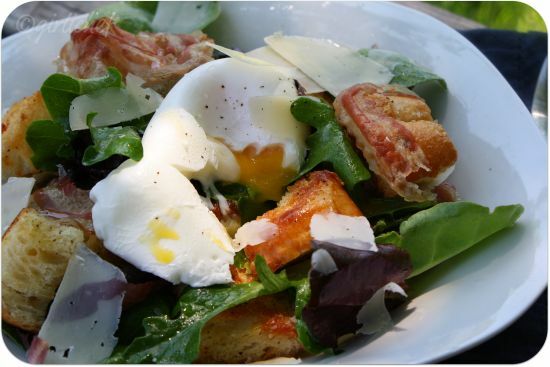 Bread, eggs and fresh greens and awesome dressing what more can I ask for. 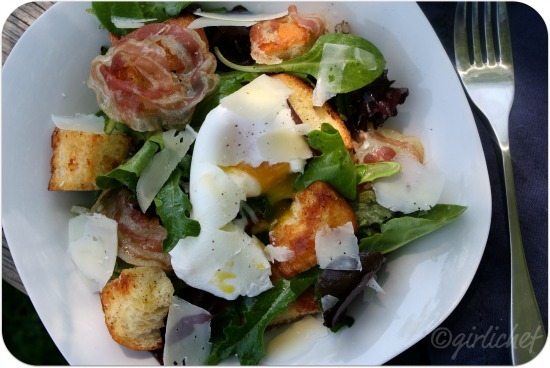 This salad looks delish, I can try them without pancetta. That is beautiful. Pancetta is the perfect meat for a salad like this. I love warm salads also...they just feel so much more like a real meal! This one looks delicious...love those poached eggs! I've never had drippy egg on salad but I can imagine it being amazing. If I could successfully poach an egg I'd definitely try it. I really, really have to make this one. And soon! Well you know anything with a poached egg gets nt attention. Beautiful salad Heather. What a beautiful salad.The poached egg on top just makes this. Better than plain old eggs benedict any day. Fabulous photos! i made this for my mom right after seeing this post, and she just love it!! LOL! thank you for sharing this. "This one is particularly satisfying with crunchy, chewy chunks of warm bread and salty crisps of pancetta over tender young greens and a warm, sunny yolk finding its way down through all the nooks and crannies." The way you described it right there was food poetry! (AND IT MADE ME DROOL!) There are some amazing salads being posted lately, and I want to try them all! Gorgeous - I love this kind of warm salad. Mmmmm....beautiful photos of one of my favorite salads. Had something similar last night for dinner with frisee! Thank you for this post! Beautiful salad! Though I'd have to go without the egg. I have weird issues with drippy eggs. But the "chewy chunks of warm bread" I could more than handle. In fact, I'd probably take more than my fair share. Well, there's no probably about it. Okay, dare I say that I love pancetta more than bacon AND those homemade croutons are making me drool! Love these kinds of salads too. Yeah baby! I want this for breakfast. How is it that the simple task of putting a perfectly-cooked egg on top of a meal makes it divine? Delish! I want to marry you!! This salad would be the perfect way to my heart - I could eat this for a meal every night of the week. I love a salad for a main meal, and I agree it needs a warm component. This has the perfect balance of fresh leaves and warm bits, crunchy bits and chewy bits, and gooey, drippy, oozy bits. Love it. Now that is a thing of beauty. Breakfast of champions. YUM! What a great salad! I love it! And being Italian, pancetta and parmigiano are among my favorite ingredients! So glad to have seen this through YBR! Just saw this on YBR and I love everything about this salad! I too enjoy a warm component in my salad, even if it's something as basic as grilled chicken. Great photos too! I will be making this very soon. So glad to have found your blog. 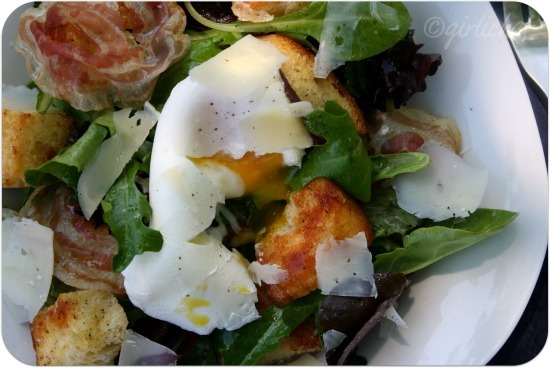 This is one gorgeous salad - the flavors and textures are a lovely balance and the egg oozing its goodness, perfectly done!